For Easter Dinner Erik and I were in charge of the veggie tray. I wanted to do something special as we had big shoes to fill and it was a holiday. I found this photo on Pinterest and thought it would be perfect for spring time! 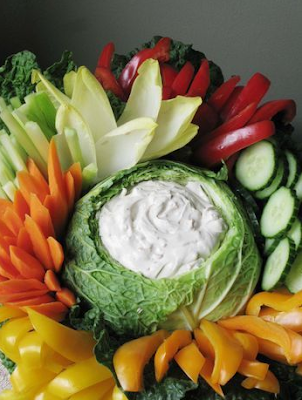 All you need is a cabbage, your favorite veggies and dip. Cut a circle into the middle of the cabbage and use a spoon to hallow it out. I placed the cabbage in the middle of large white latte bowl since we didn't have a tray. Then I added the vegetables around the cabbage. I went with vegetables I knew my family liked. I created a pattern by placing the round vegetables in between the long vegetables. Tall carrots, round cucumbers, tall celery, round tomatoes, etc, etc. I had a lot of green veggies so I also tried to break them up with the colorful ones. Add your favorite dip to the hollowed out cabbage. Super easy and super festive. I think this is the perfect veggie display for any occasion. 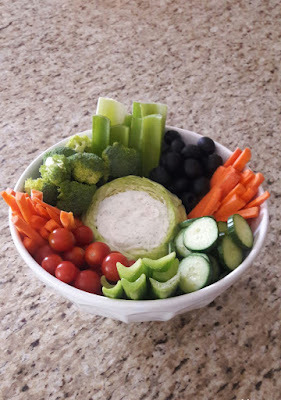 What are some fun veggie trays you've tried or seen?